Profit from the new insights in Search Analytics! Property Sets will treat all URIs from the properties included as a single presence in the Search Analytics feature. This means that Search Analytics metrics aggregated by host will be aggregated across all properties included in the set. For example, at a glance you'll get the clicks and impressions of any of the sites in the set for all queries. This feature will work for any kind of property in Search Console. 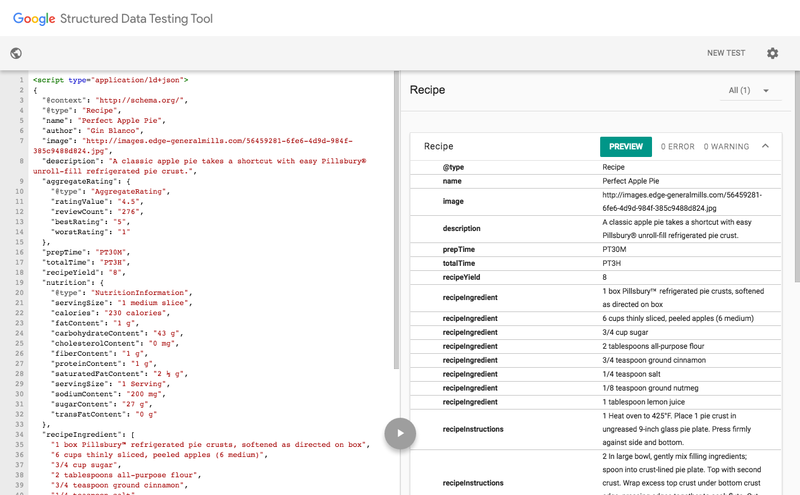 Use it to gain an overview of your international websites, of mixed HTTP / HTTPS sites, of different departments or brands that run separate websites, or monitor the Search Analytics of all your apps together: all of that's possible with this feature. We'll be rolling this out over the next couple of days. If you have multiple properties verified in Search Console, we hope this feature makes it easier for you to keep track. If you have any questions, feedback, or ideas, please come and visit us in the webmaster help forum, or read the help documentation for this new feature! P.S. Want to become a beta-tester for future features? Just sign up to become a beta-tester and we'll get in touch. Mobile app, mobile website, desktop website -- how do you track their combined visibility in search? Until now, you've had to track all of these statistics separately. 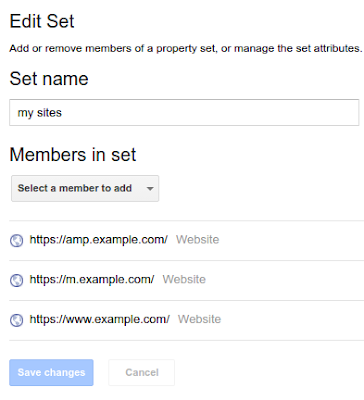 Search Console is introducing the concept of "property sets," which let you combine multiple properties (both apps and sites) into a single group to monitor the overall clicks and impressions in search within a single report. In 2016, we launched rich cards in the US, creating a new way for site owners to present previews of their content on the Search results page. 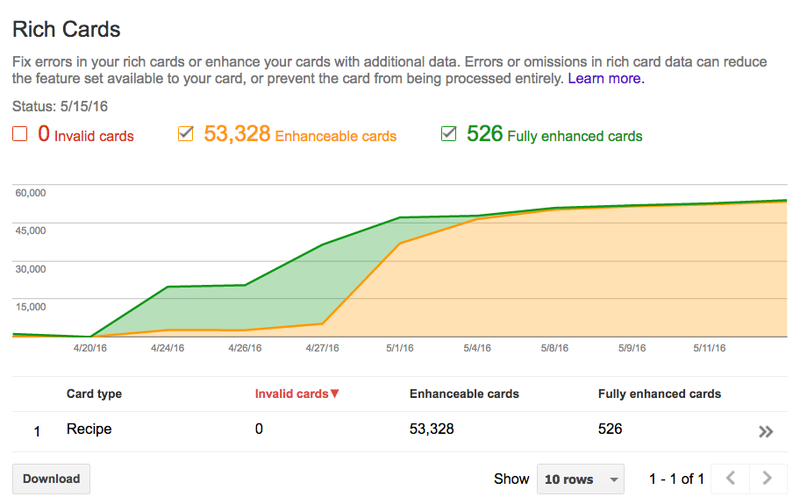 Starting today, sites all over the world can now build rich cards across Google Search. By building Rich Cards, you have a new opportunity to attract more engaged users to your page. Users can swipe through recipes in the UK from sites like BBC Good Food or browse movies in Mexico from Cinepapaya or view restaurants in Germany from Prinz.de. Also, rich cards support the AMP format. So if you build AMP pages, users will be able to swipe near instantly from page to page. 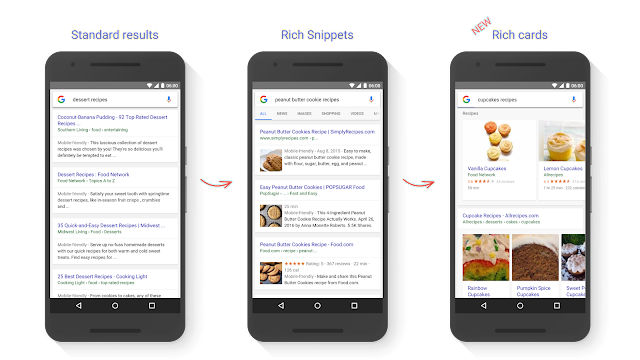 Evolution of search results for queries like [peanut butter cookies recipe]: with rich cards, results are presented in carousels that are easy to browse by scrolling left and right. Carousels can contain cards all from the same site or from multiple sites. For site owners, this is a new opportunity to stand out in Search results and attract more targeted users to your page. For example, if you have a recipe site, you can build a richer preview of your content with a prominent image for each dish. This visual format helps users find what they want right away, so you're getting users who specifically want that especially delicious cookie recipe you have. We’re starting to show rich cards for two content categories: recipes and movies. They will appear initially on mobile search results in English for google.com. We’re actively experimenting with more opportunities to provide more publishers with a rich preview of their content. We’ve built a comprehensive set of tools and completely updated our developer documentation to take site owners and developers from initial exploration through implementation to performance monitoring. We strongly recommend using JSON-LD in your implementation. Find out which fields are essential to mark up in order for a rich card to appear. We’ve also listed additional fields that can enhance your rich cards. In the Rich Cards report, you'll see which cards can be enhanced by marking up additional fields. A: Yes, you can! We’ll keep you posted as the rich result ecosystem evolves. 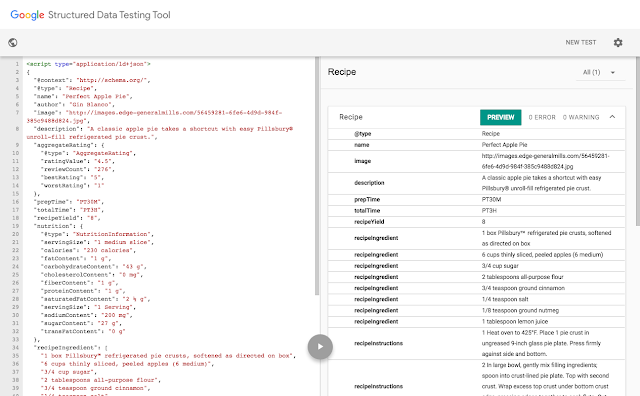 A: The Structured Data report will continue to show only top-level entities for the existing rich snippets (Product, Recipe, Review, Event, SoftwareApplication, Video, News article) and for any new categories (e.g., Movies). 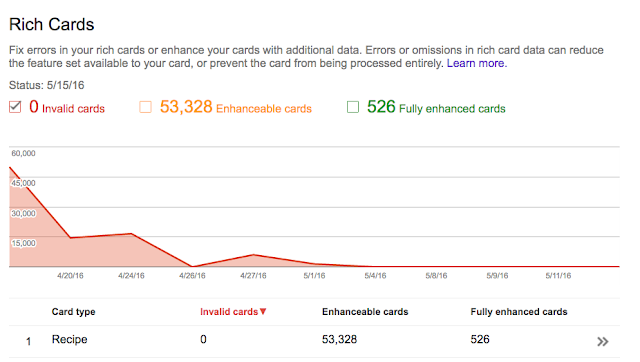 We plan to migrate all errors from the Structured Data report into the Rich Card report. A: Technical and quality guidelines apply for rich cards as they do for rich snippets. We will enforce them as before. Learn more about rich cards in the Search and the mobile content ecosystem session at Google I/O (watch the recording on YouTube) or in our developer documentation. If you have more questions, find us in the dedicated Structured data section of our forum, on Twitter or on Google+. 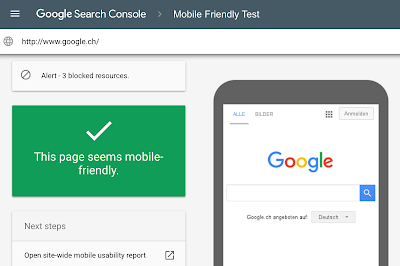 The updated tool provides us with room to continue to improve on its functionality, and over time, we expect it to replace the previous Mobile Friendly Test. Additionally, of course this tool also works well on your smartphone, if you need to double-check something there! We'd like to invite you to take it for a spin, try your website and other sites that you're curious about! Let us know how you like it - either here in the comments or in our webmaster help forums. Mobile is close to our heart - we love seeing more and more sites make their content available in useful & accessible ways for mobile users. To help keep the ball rolling, we've now launched a new Mobile Friendly Test. Google Analytics helps brands optimize their websites and marketing efforts for all sources of traffic, and Search Console is where website owners manage how they appear in Google organic search results. Today, we are introducing the ability to display Search Console metrics alongside Google Analytics metrics, in the same reports, side by side - giving you a full view of how your site shows up and performs in organic search results. For years, users of both Search Console and Google Analytics have been able to link the two properties (instructions) and see Search Console statistics in Google Analytics, in isolation. But to gain a fuller picture of your website’s performance in organic search, it’s beneficial to see how visitors reached your site and what they did once they got there. With this update, you’ll be able to see your Search Console metrics and your Google Analytics metrics in the same reports, in parallel. By combining data from both sources at the landing page level, we’re able to show you a full range of Acquisition, Behavior and Conversion metrics for your organic search traffic. This feature out is rolling out over the coming few weeks, so not everyone will see it immediately. The new reports allow you to examine your organic search data end-to-end and discover unique and actionable insights. Your Acquisition metrics from Search Console, such as impressions and average position, are now available in relation to your Behavior and Conversion metrics from Google Analytics, like bounce rate and pages per session. • Find landing pages that are attracting many users through Google organic search (e.g., high impressions and high click through rate) but where users are not engaging with the website. In this case, you should consider improving your landing pages. • Find landing pages that have high site engagement but are not successfully attracting users from Google organic search (e.g., have low click through rate). In this case, you might benefit from improving titles and descriptions shown in search. • Learn which queries are ranking well for each organic landing page. • Segment organic performance by device category (desktop, tablet, mobile) in the new Devices report. Each of these new reports will display how your organic search traffic performs. 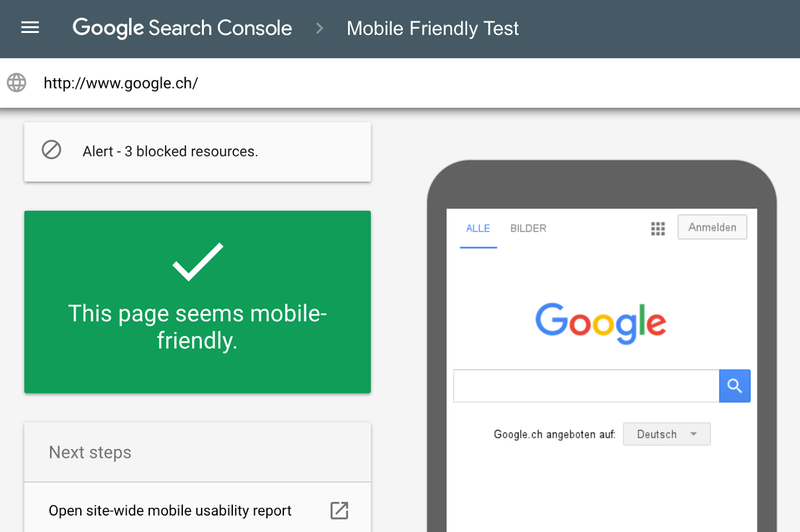 As data is joined at the landing page level, Landing Pages, Countries and Devices will show both Search Console and Google Analytics data, while the Queries report will only show Search Console data for individual queries. The same search queries will display in Google Analytics as you see in Search Console today. As mentioned in our Search Console Help Center, some data may not be displayed, to protect user privacy. For example, Search Console may not track some infrequent queries, and will not display those that include personal or sensitive information. Also, while the data is displayed in parallel, not all Google Analytics features are available for Search Console data - including segmentation. Any segment that is applied to the new combined reports will only apply to Google Analytics data. You may also see that clicks from Search Console may differ from total sessions in Google Analytics. To experience the new combined reports from Search Console and Google Analytics, make sure your properties are linked, and then navigate to the new section “Search Console”, which should appear under “Acquisition” in the left-hand navigation in Google Analytics. Search is a powerful tool. It helps people to find, share, and access an amazing wealth of content regardless of how they connect or where they are located. As part of Google’s search quality team, we work hard to ensure that searchers see high quality search results—and not webspam. We fight spam through a combination of algorithms and manual reviews to ensure that sites don’t rise in search results through deceptive or manipulative behavior, especially because those sites could harm or mislead users. Below are some of the webspam insights we gathered in 2015, including trends we’ve seen, what we’re doing to fight spam and protect against those trends, and how we’re working with you to make the web better. We saw a huge number of websites being hacked – a 180% increase compared to the previous year. Stay safe on the web and take preventative measures to protect your content on the web. We saw an increase in the number of sites with thin, low quality content. Such content contains little or no added value and is often scraped from other sites. As always, our algorithms addressed the vast majority of webspam and search quality improvement for users. One of our algorithmic updates helped to remove the amount of hacked spam in search results. More than 400,000 spam reports were submitted by users around the world. After prioritizing the reports, we acted on 65% of them, and considered 80% of those acted upon to be spam. Thanks to all who submitted reports and contributed towards a cleaner web ecosystem! We conducted more than 200 online office hours and live events around the world in 17 languages. These are great opportunities for us to help webmasters with their sites and for them to share helpful feedback with us as well. The webmaster help forum continued to be an excellent source of webmaster support. Webmasters had tens of thousands of questions answered, including over 35,000 by users designated as Webmaster Top Contributors. Also, 56 Webmaster Top Contributors joined us at our Top Contributor Summit to discuss how to provide users and webmasters with better support and tools. We’re grateful for our awesome Top Contributors and their tremendous contributions! We’re continuously improving our spam-fighting technology and working closely with webmasters and users to foster and support a high-quality web ecosystem. (In fact, fighting webspam is one of the many ways we maintain search quality at Google.) Thanks for helping to keep spammers away so users can continue accessing great content in Google Search.